One of the most difficult things about parenting can be getting your child to eat a healthy, balanced meal. Riley has been an amazing eater for the most part, but now that he is getting closer to 2 years old he enjoys exercising his ability to reject what I’ve placed in front of him. He usually does this by throwing it on the floor. It’s great fun. Fortunately, I have an arsenal of no-fail recipes that rarely see the floor. A lot of people ask me what I make for Riley and my answer is that 90% of the time I make the same thing for him that I’m making for Brad and myself. When that doesn’t work after a few tries, I’ll go to one of these 5 foods to make sure Riley gets healthy, nutrient-rich food into his little toddler body. This smoothie has been a saving grace in our house and Riley ALWAYS finishes every last drop. Sometimes, he asks for more. "More, quease!" he says in his adorable little voice. I make this smoothie at least twice a week and Riley gets a huge amount of healthy green kale, protein rich almond milk, and sweet pineapple. You can substitute baby spinach leaves or even chard for the kale. I usually make enough so that I can have a glass as well, making it a double win. 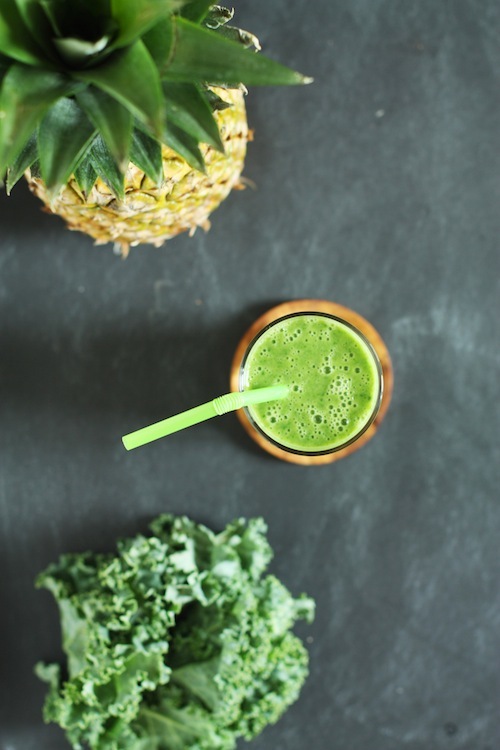 And no, the kale flavor is not as intense as it can be in some smoothies. So. Good. Click here for the recipe. I’m confident that I could put pesto on just about anything and Riley would eat it. We mix it into scrambled eggs, spread it on toast, and mix it in with whole wheat pasta. For the last 2 summers, I’ve grown an insane amount of basil and made a huge batch of pesto with it. I then freeze it in ice cube trays for a couple of hours, transfer it to a freezer bag and we’re ready to go for a few months. The frozen pesto is thawed in the microwave for a few seconds and stirred with warm pasta. On our “adventurous” days, I’ll add chicken or salmon as well. See below for my pesto recipe. More pesto! I try to mix things up when I use pesto. I’ve fallen in love with this kale pesto recipe. It is creamy, full of bright flavors, and a beautiful shade of green (some kale pesto recipes end up paste-like and kind of a muddy color). I have a stash of it in the freezer next to the basil pesto. We also love arugula pesto on grilled cheese. Sometimes, I use a George Foreman grill (fancy, I know) so that I don’t have to add butter to the bread. This is the perfect lunch after a morning at the park.Click here for the grilled cheese recipe. Salmon is such a powerhouse when it comes to health and I try to work it into our weekly meal plan on a weekly basis. Typically, I buy my salmon in bulk and freeze portion sizes. They are easy to thaw last minute and even faster to cook. Riley loves it mixed with Japanese sticky rice and a little soy sauce or just plain with some healthy sides like apple slices and whole grain crackers. Find the recipe at the bottom of this post. OK- so this one is more of a treat than the first 4 foods on the list. But fortunately, you can make it healthier by adding some whole wheat flour. What’s most important in my mind is that I know exactly what is in these crackers (and can spell each ingredient). When I make these, Riley cannot keep his hands off of them from the moment they come out of the oven. Cheesy and hearty, these crackers make a perfect snack; it only takes a few rather than handful after handful to feel satisfied. Click here for the recipe. Some other foods we typically have success with are roasted broccoli stirred into macaroni and cheese, peanut butter and banana toast with wheat germ, and yogurt. Always yogurt. I hope this list helps some of you when it comes to a picky toddler! I really recommend trying the pesto. That one ingredient has been a revolution. What are your most successful toddler meals? I’d love to be able to add to my list! Season the salmon fillet with salt and pepper. Place the butter on a rimmed baking sheet. Melt the butter in the oven for 2 or 3 minutes, being careful not to let it burn. Carefully remove the baking sheet from the oven and lay the salmon fillet over the melted butter. Return to the oven and roast until the salmon is cooked through but not overdone, about 8-9 minutes. The salmon should flake easily with a fork and will be a very light pink (but not raw) in the center and more opaque near the surface. Combine the basil, garlic, nuts and lemon juice in the bowl of a food processor. Pulse a few times until just combined and roughly chopped. With the food processor running, gradually add the olive oil. Transfer the pesto to a bowl and stir in salt and pepper to taste. If you would like to freeze the pesto, spoon it into an ice cube tray and top with a little extra oil this helps preserve the color). Freeze for an hour or two until frozen through. Transfer the pesto cubes to a freezer bag and store for up to 3 months.